In the data that the server sends the launcher, there is a list of cvars. Where can i find this list? 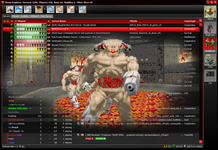 Internet Doom Explorer - non-portable win32 closed-source (yet) launcher for client/server Doom ports :) - support Odamex now.